According to the original definition of mechatronics proposed by the Yasakawa Electric Company and the definitions that have appeared since, many of the engineering products designed and manufactured in the last 25 years integrating mechanical and electrical systems can be classified as mechatronic systems. Yet many of the engineers and researchers responsible for those products were never formally trained in mechatronics per se. The Mechatronics Handbook can serve as a reference resource for those very same design engineers to help connect their everyday experience in design with the vibrant field of mechatronics. More generally, this handbook is intended for use in research and development epartments in academia, government, and industry, and as a reference source in university libraries. engineering students studying within the traditional structure of most engineering colleges. It is evident that there is an expansion of mechatronics laboratories and classes in the university environment worldwide. This fact is reflected in the list of contributors to this handbook, including an international group of 88 academicians and engineers representing 13 countries. 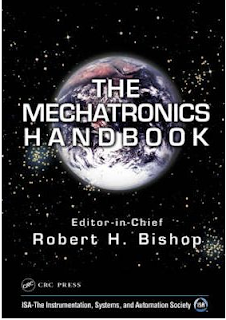 It is hoped that the Mechatronics Handbook can serve the world community as the definitive reference source in mechatronics.